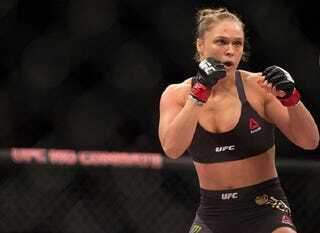 As widely expected, Ronda Rousey beat Bethe Correia, knocking out the Brazilian fighter in only 34 seconds. The fight might have seemed short, but it was longer than Rousey’s last two fights combined. The victory—which Rousey dedicated to “Rowdy” Roddy Piper—marks her 11th first round win in the last 12 fights. Check out the full video on Deadspin. UFC women’s bantamweight champion Ronda Rousey of the United States rushes forward against Bethe Correia of Brazil. Image via Getty.